The marathon distance of the 26 miles 385 yards (42.195 km for you metric folks) was adopted for the 1908 London Olympics. Originally planned for 26 miles, the route was extended to allow a start at Windsor Castle for the route to White City. There was enormous public sympathy for Pietri, and the Sporting Life newspaper attempted to cash in on this with a strange race on Saturday, 18 December 1909 with 524 laps around a matting course inside the Royal Albert Hall. Pietri was pitted against a Lewisham runner, Charlie Gardiner, who was billed as “The Professional Champion Marathon Runner of All England” having won the third race over the Olympic course in May 1909 beating Frenchman Hector Labry in 2:53:23, as a professional was excluded from the Olympics. Gardiner is in the hoops in the photos. Gardiner was born in Deptford on 1 August 1881 he was one of at least 8 children to Charles (Senior) and Ruth who were from Greenwich and Suffolk respectively. Census records show that they were a family that had moved a lot from Suffolk to Greenwich, Essex, Poplar and Deptford. By 1891 they were living in the delightful sounding Esplanade Terrace in Lewisham. Idyllic it certainly wasn’t – it was backed by the railway and part of the Ravesnbourne and at the front looked out onto one of Lewisham’s mills, see Godfrey edition map below. Charles Booth’s poverty maps colour it – dark blue ‘Very poor, casual, chronic want.’ It was where Bankside Avenue (below right) now is. Charlie had been amongst the best middle distance runners in Kent in early years of the 20th century, running for Cambridge Harriers (1). He turned professional in 1906 and joined Professional AC where he helped organise a 4 mile race on Shooters Hill Road from the Green Man, which he won (2). He started racing in Scotland during summers having success at Braemar in 1908 and was winning decent amounts of prize money elsewhere (3). He was still a part-time professional in 1909, working in the Shell Department at Woolwich Arsenal (4). He was small (1.67 m) and light (55 kg) (5) and his training regime included walking to and from work each day (14 miles a day) (6). 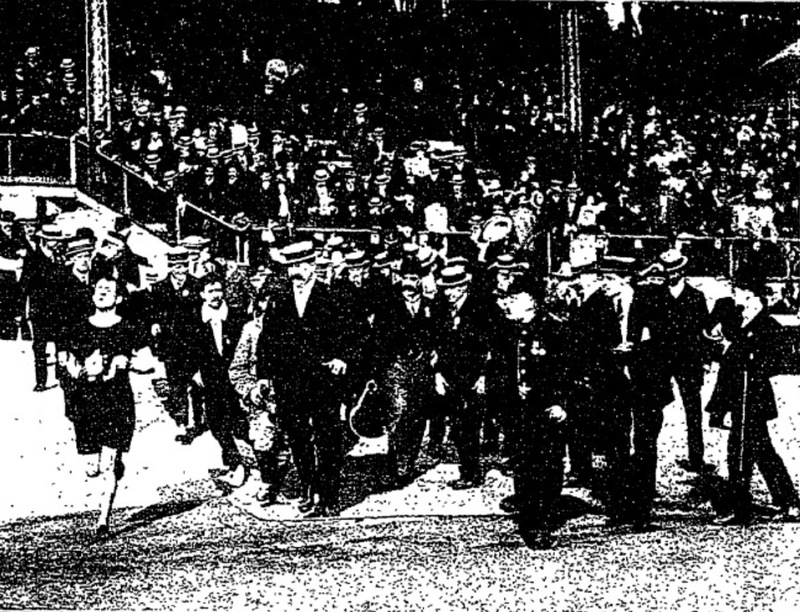 His big break was winning the Windsor to White City Marathon in May 1909 over the previous summer’s Olympic course – his entrance to the stadium is pictured above (7). He was given a hero’s welcome on his return to Lewisham. He was met at the station by a band and carried to a reception at the Roebuck which displayed a banner “Welcome Lewisham’s Champion, Bravo! CW Gardiner we are proud of you!” Similar banner put up outside the nearby Sainsburys close to the Obelisk (8). Charlie wasn’t the only runner in the family, the report of his victory over the Olympic route described Charlie as being a member of a ‘fine athletic family, several of his brothers being well known amateur runners.’ His brother Jack seems to have been a good cross country runner, winning the South of the Thames race (9). It appears that it was in a red and black hooped so his club, was probably Herne Hill Harriers. The vest was seen as lucky and was worn by Charlie in both the race on the Olympic route and at the Albert Hall (10). In the report of the race at the Albert Hall, Gardiner was described as ‘tall and lithe’ with ‘a long swinging, graceful stride’, Pietri ‘a quaint little figure’. Pietri had been persuaded, by sponsors perhaps, to wear pair of ‘new stiff shoes’. The two athletes stuck together for the first 10 miles, running ‘like automatons on an automatic toy’ with Charlie Gardiner just leading. Pietri then pulled up, the new shoes had led to blisters – his aides tried to deal with it by putting in cotton wool pads but Gardiner with a ‘machine like gait, forged further ahead’ as Pietri struggled with the pain eventually retiring at 23 miles. Gardiner finished the course in a new indoor marathon record of 2:37:12 winning a prize of £100 in the process. Charlie Gardiner used his successes in the marathons and at Braemar to get invitations to other professional races and presumably gave up his job at Woolwich Arsenal to enable him focus on running full time. He won a marathon in Glasgow which finished at Celtic Park Stadium, and won £25 with a slightly faster than time on Olympic route. A telegram with news of the result was exhibited at Obelisk House in Lewisham to much interest (11). There were a series of strange three way races during the summer of 1909 he took part in including at Kircaldy Police Sports between Gardiner, billed ‘world champion foot runner’, J Cunningham ‘world champion grass track cyclist’ and G Fowler ‘America’s wonderful champion bottle carrier; (12) with a similar race on in Rosherville Gardens in Gravensend (13). He beat Catford professional, W Swann, and another man in a 5 mile race in Montrose – Charlie ran all 5 miles, whereas the other two did it as a relay (14). It is clear that he spent 5 or 6 weeks in the Scottish summer of 1909 and probably over raced – he and another well-known professional J Price were comfortably beaten in Fife towards the end of July (15). After a hectic summer, there are no reports of him racing again until the Albert Hall. He has being coached by Bob Hunter, referred to as the trainer at Millwall FC who were still (just) on the Isle of Dogs (16). Bob Hunter was a Millwall stalwart – he was trainer from around 1897 to 1918 and after the war became Millwall’s longest serving manager – from 1918 until his death from cancer in 1933. He had Scottish roots although was born near Scarborough – so this may partially explain the volume of racing that Charlie did in Scotland. He was in high demand for appearances after beating Pietrie but probably didn’t allow enough recovery time – he dropped out of the Powderhall Marathon on New Years Day 1910, presumably having picked up some appearance money (17). It is part of a much bigger race day for professional athletes that still continues. He’d recovered by July and comfortably beat Birmingham’s Price and Dartford’s Kitchener in a marathon in Newcastle (18). 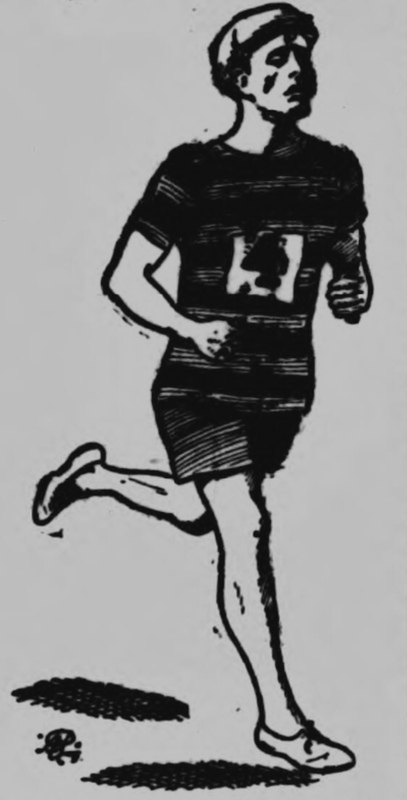 He won a 20 mile race in Wednesbury in West Midlands over 20 miles against other notable runners of generation, J W Kitchener of Dartford who had won the Paris Marathon, J Price a Birmingham runner (19). It seems likely that this event was filmed, and was played at local cinemas, including Central Hall Picture Palace, although there is sadly no evidence of the footage having survived (20). He comfortably won an 11 mile race in Norwich (21) but was beaten over 15 miles by his long term rival Price at Ibrox Park a couple of weeks later in August 1910 (22). Despite the billing at the Albert Hall he wasn’t the quickest British runner – his best had been bettered by three other British runners in 1909. But in 1911 Charles Gardiner recorded the quickest outside marathon, run by a British runner ever with a time of 2:39:08, at the Powderhall New Year’s Day race in January 1911. The two better times in the world that year were in the same race. There were no other mentions of Charlie in the press until the following year, perhaps he suffered from injuries and wasn’t able to compete. He was back at Powderhall for the 1912 race, but wasn’t mentioned in the report (23). He was mentioned in the entries for the Isle of Man marathon in August (24) but he never made the start line, with the best professional runner in the world at that time, the Finn Kolehmainen, (25) winning. The pattern was similar in 1913 where there were a few entries and invitations, mainly to 10 mile races – including one in Arbroath (26), but his name never cropped up in results or reports of race. His only reported success seems to have been an hour race around the pitch at Millwall’s new ground the (Old) Den (27). He was back there in May 1914, coming second in a ‘poor marathon’ over 10 miles (28). His final reported race was a second place in a similar race around the edge of the pitch at Griffin Park, Brentford (29). Any chance of resurrecting his career will have ended with World War One when much sporting activity was put on hold. He would have been 37 after hostilities ended and no doubt went back to civvy street. 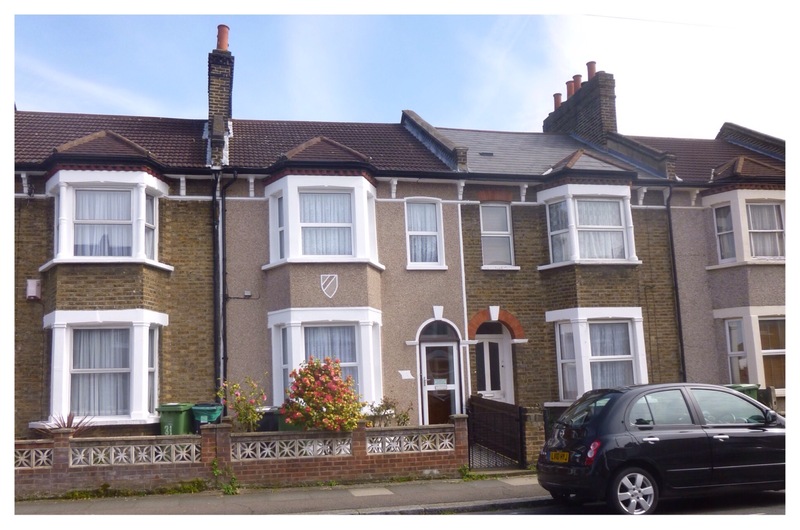 His earnings as a professional enabled him to move from Mill Road where he was still living in 1906 to 33 Marsala Road (below) by 1909. He was listed there in the 1911 census as Professional Runner; while only a few hundred metres away, it was a world away from Esplanade Terrace and Mill Road. The family stayed in Lewisham – in the 1939 Register (a mini census done for rationing), he and Louisa were living six doors down Marsala Road at 21. Charlie was working as a labourer at an aircraft factory, also in the house was Louisa’s mother, also Louisa, who was described as ‘incapacitated’, and a son Anthony who was seeking work. Charlie seems to have remained in Lewisham until his death in 1965. It is a measure of the improvement in training that in 2017 over 250 British runners beat that Gardiner’s outside record, the best was Dewi Griffiths at 2:09:49 and from local clubs Blackheath and Bromley’s Scott Overall ran 2:10:55 and Kent AC’s Russell Bentley 2:20:20. Hopefully, those running spring marathons this year though will learn from Pietri’s failure to use tried and tested kit. Note – the census and related data come from Find My Past. This entry was posted in Lewisham History, Sporting & Aviation Pioneers and tagged Albert Hall marathon, C W Gardiner, Charles Gardiner, Charlie Gardiner, Dorando Pietri, marathon on April 2, 2015 by Paul B. Thank you for this interesting write up. Charlie’s brother was my great grandfather. You are more than welcome Sarah. I hope I did him ‘justice.’ Do you or other family members know anything more of his career or what happened after he finished racing. It would be great to add to the post. I wasn’t planning to return to the post unless I stumble across anything new, but at some stage I may well do a bit more on Esplanade Terrace as it was one of the poorer parts of Lewisham based on Booth’s maps and think there may be some interesting stories to unpick. Thanks for visiting. Unfortunately, we do not know a great deal. Most of our info comes from sources outside the family. I have seen some photos of him. Mum and I hoped to get to the 100th anniversary event at the Royal Albert Hall in 2009, but were unfortunately prevented by bad weather. I believe some family members did attend. Thank you again. I have just had a look at the 1939 Register, a bit like the census but done for rationing etc – he and Louisa were still living in Masala Road and Charlie was working at an aircraft factory. Will e mail you an image of the records in case it is of interest & will do an update of the blog post at some stage. Charlie Gardiner was my great grandad! It is really interesting to find this article. Glad you found it interesting, if there is anything else you know about him that would be of wider interest, do let me know and I will add to the post. Charlie is my Great Grandad I have his daughters name as my middle name so proud to be a part of his history and loved the article to learn something new is so amazing! I am so glad that you liked it Tracy. Great article, and very interesting. My father Norman and his brother Pete, are sons of Phyllis, Charlie Gardiner’s daughter. They attended the anniversary at the Royal Albert Hall and in fact started the ‘anniversary race’. I’m sure either of them can fill in gaps or questions you may have. Thanks – I will be in touch (maybe not for a month or two, but will be in touch) as would love to find out more of Charlie’s story. I am also planning at some stage to do a post on Mill Road where I think some of the family ended up. Charlie Gardiner’s story is a part of athletics history, and I’m researching his life for the athletcs journal which I edit. Can I have copies of the photos of Charlie and Dorando Pietri in the Royal Albert Hall ? I was born in Hither Green. I think that the photo originally came from the defunct Illustrated London News, I’ll try to dig out a better copy of it – will e mail it to you if I find it. You are right about it being an important story, his times are so impressive given the training methods used – his coach was a football trainer. It was always a post that I intended to revisit both in terms of his career and Esplanade Terrace in Lewisham. I’ve just done the research for an update on his career which I was planning to publish as an update to the original post at around the time of the London Marathon. I will send you a link when I do.